We furnish high precision Rain Gun Sprinkler that is remarkable for its superior performance. Our Dust Control Rain Gun Sprinkler is made from the best quality raw materials accessible in the market. These rain gun sprinklers are used for irrigation in a larger field minimum time and pressure as compared to conventional sprinklers. 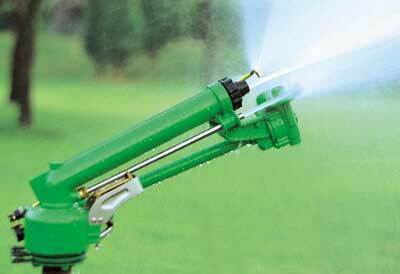 Additionally, we are one of the renowned Portable Rain Gun Sprinkler Manufacturers in India. Lightweight, superior finish and sturdy, easy to shift. Uniform sprinkling with condition to calibrate droplet size and rainfall rate, suitable to all soils and crops. One Ajay Rain Gun Sprinkler substitutes various conventional sprinklers saving considerably in labour and time taken for irrigation. Quick fit accessories for connecting to PVC or G.I. or HDPE main lines. Early sowing & better germination of seedling through optimum moisture condition of soil which is possible by Rain Gun Sprinkler System. Liquid fertilizer can be applied quickly over large areas. It saves on fertilizer quantity, foliar application hence results in good yield. Simple maintenance with prompt After Sales Service. Free Survey, Design and Installation. No matter how difficult the problem, no matter which type of equipment you will choose, we will offer you the best solution for your irrigation problems.